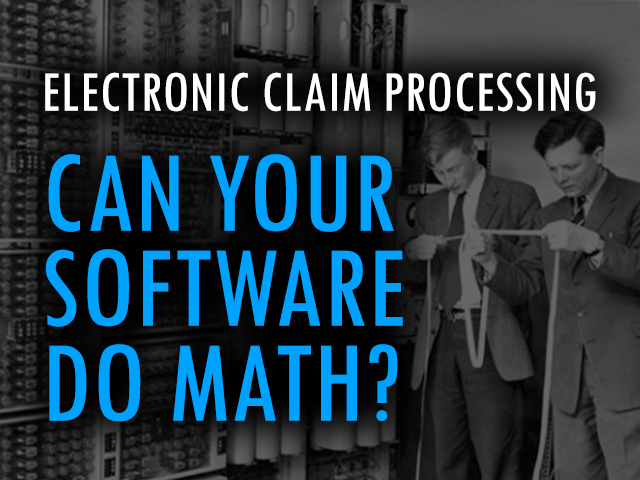 HomeElectronic Claim Processing – Can Your Software Do Math? Electronic Claim Processing – Can Your Software Do Math? As a vendor of software that edits and creates ANSI 837 claim files, we try to stay informed regarding the processing of these transactions. One method that I recommend for all Medicare providers is to make sure that you obtain the memos issued by CMS through the Medicare contractors (MAC). From time to time, the MACs distribute top ten lists of the most common errors they find in processing claims. I received a list today from Novitas. This list is further broken down by state. The one I am referencing in this article is for New Jersey for April of 2015, but I think you will find that it is representative of all Medicare part A provider claim processing throughout the country. The list includes the reason code, description and the resolution for each issue. However, even if these claims are corrected, AR days are needlessly wasted for errors that could easily be prevented. The first issue represents the most errors down the least at number ten. Actual counts aren’t given. The most amazing thing is that three of the top ten errors, including the largest one, are due to mathematical errors. Medicare accepts files only in an electronic format (ANSI 837). This means that these files are created exclusively by computers. These systems may compile the data as part of a complex and expensive EHR/Patient Accounting system or the claims may simply be entered through a terminal, like the Medicare DDE system. Either way, there is one thing that computers are good at and that is math. They just need to be told what to add. The fact that these errors are even possible is a symptom of poorly designed and supported applications that allow these files to be created without the simplest validation rules in place. This only requires that the software check three fields on the claim, if these codes are present, the operating physician is required. On institutional claims, attending physician is always a person, the billing provider is always a facility. These are two distinctly different types of NPI’s each with a different qualifier code designating them as a person or a place. It is difficult to understand how someone experienced in billing could think they are the same. It is inexcusable for a software application designed to process claims to allow this error to occur since all you have to do is check the qualifier used for the NPI and not the NPI itself. Really? How can it be possible to screw up the total of a few dollar amounts? I would assume that most systems don’t require the user to key in the total, this means that they can’t add these numbers correctly. If your system allows this type of error, it should send a chill up your spine. What other types of more complex errors might be happening? Considering that just about anything else is more complex. Many programming languages include a function that calculates the number of days between two dates if you provide the two dates. This number, should be equal to covered days + non-covered days. Catching this error would take two lines of code at most in any programming environment. Once again, this is as simple as comparing one number with another number. Are they equal? If not, the claim should not be processed until it is corrected. Without actual numbers associated with these errors and the dollars involved, it is difficult to calculate how much these errors cost the industry in delayed payments and duplication of claims processing services. However, issue #1 is related to inpatient and skilled nursing claims that are almost always high dollar transactions. What we do know is that these errors represent the ten most common reasons that claims are rejected. Beyond the top ten, it is even more likely that the remaining errors are at least as equally preventable as these common ones. As a provider, you should check to see if your process would allow these types of errors to occur. If it can, ask your vendor why.